Don your battle vest and crank up your stereo as Nekromant open their treasure chest of solid-gold riffs and take you on a fantastic ride. The Nekromant Lives, and so does metal. With the subtlety of starting up a V8 engine, Nekromant burst through the speakers with the title track. The gallop-tastic riffing crosses the line between classic metal and NWOBHM successfully. They don’t waste a moment, getting straight to the point with some sing-along chorus action and a really melodic guitar solo. Nekromant don’t let up from this point onwards either. “Voidwalker” gets into heavier territory, sounding a little like Alice In Chains at times; nice and beefy. This could be classed as a modern influence, but surely grunge is retro now, right? They exude this old-skool vibe throughout, as they chop and change to a fast paced middle section, before returning back to head-nodding speed for a grunty riff at the end. Things basically continue in a similar vein, and that’s definitely a good thing! The quality of the riffs and vocal sections are all up to the standard that I require from my metal. “Scorpio” evokes early Iron Maiden with the dual lead melodies galloping 6/8 rhythms. There’s even a great little ‘foot-on-the-monitor’ guitar solo, with thundering bass underneath, that just sounds glorious. ‘Is that all the band have to offer?‘ I was wondering. 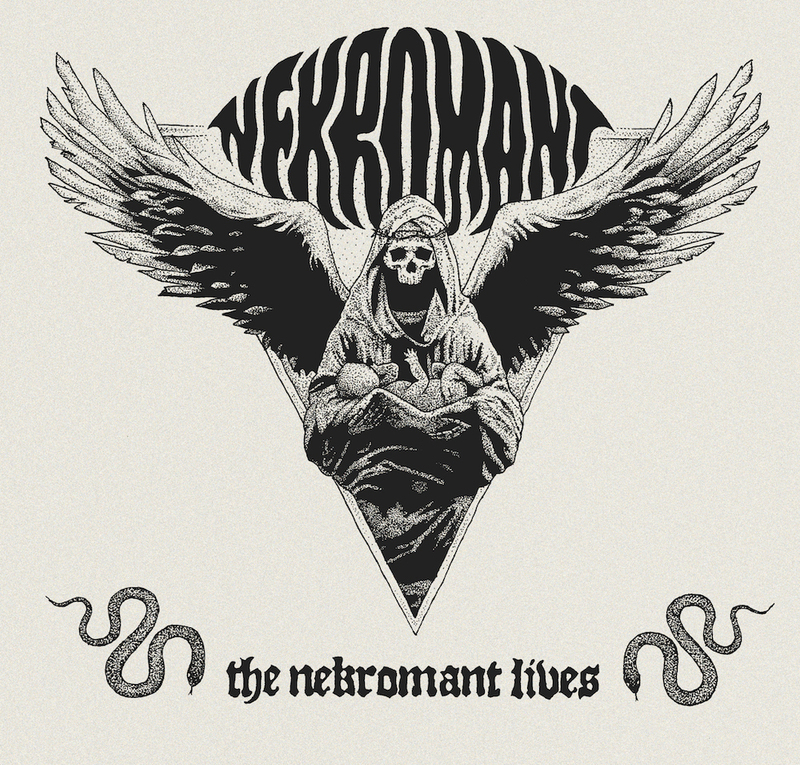 Well, sort of, but Nekromant seemed to have cherry-picked their riffs and songs so that the listener just gets the best of the best. Things even start to get a little more epic as well, with the obligatory instrumental track, “Wolves Mountain” (remember when all classic metal bands had at least one of these on an album?). This is an instrumental like it should be; a collection of classic riffs and fast as hell playing. While listening to it, I could just imagine the pack of wolves running all over the mountain in bloodthirsty fury, chasing down their next kill. The slower groove towards the end, and addition of the metal-male-choir, adds the epic finishing touch. Prepare to sing along to this one live. When it comes to the lyrics, they have all the right subject matter covered. You’re not going to hear about the singer’s first love, or breaking up with a long-term girlfriend. Travelling through the netherworld? Check. Sacrifices? Check. Breathing Fire? Check. Unveiling the universe before you? Check. That’s just the lyrical content in “Blood for Walpurgis” alone! Although those are the highlights, when it comes to the rest of the album, there are plenty more treats in store. “Exit Spell” and “Eye In The Sky” are solid head nodders. “We Want You Dead” is a great album closer that evokes more Maiden-vibes with the ever changing tempos, creative bass, and dual lead melodies. There’s no space on this album for a syrupy ballad or an acoustic jam. If I’d wanted that, I’d look somewhere else. This album is first-class metal done right. I see plenty of click-bait articles around at the moment claiming that this genre of music is running out of ideas. First of all, that’s complete nonsense! Just taking one look at the EverythingIsNoise.net reviews section shows there are a myriad of new and exciting bands out there. Secondly, when a band like Nekromant come along, deliver a thick slice metal done right, something to bang your head to and have fun with, who bloody cares! Just one look at the band shows they know their subject matter and their heritage. This deep knowledge shines through with the quality of each song. The band focus on solid riffs, great swirling retro vocals, thundering drums and face melting guitar solos. With The Nekromant Lives, they have also managed to capture the unique energy that’s needed to make this genre special. Nekromant pretty much have it all: skull logo artwork, dark tracks called things like “Voidwalker” and “Blood For Walpurgis”, and long hair. Combining this with the 36 minutes of almost pure perfection that I have just been banging my head to creates an awesome experience that no other genre can match. Now, where do I get a patch to add to my battle vest?! Previous PostThe Mon - "Doppelleben"